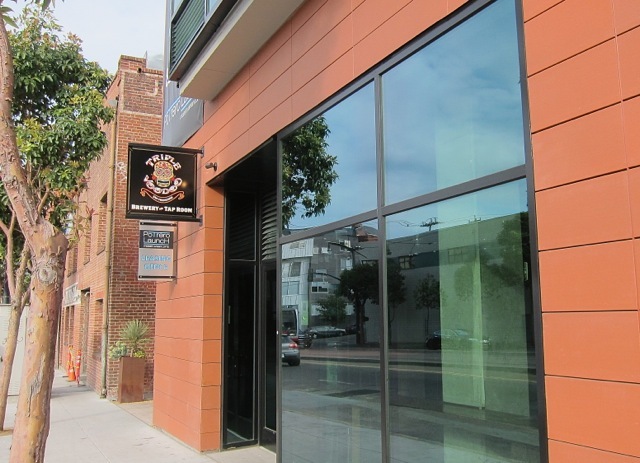 After four years as a contract brewer, Triple Voodoo opened its doors in 2014 to a brewery of their own in the Dogpatch neighborhood of San Francisco. The taproom of this ten-barrel brewery is styled with a modern industrial look. Lots of metal and concrete, most locally sourced, fits nicely into this neighborhood. There is a nice size bar and tables throughout the room at which to enjoy the selection of Triple Voodoo’s and guest beers from the 16 taps. Tours of the brewery are available. Extras: Magnolia Brewery/Smokestack BBQ Restaurant is just 2 blocks away on 22nd and 3rd. Harmonic is walkable as well. Further out along 3rd Street to the Evans St. MUNI stop will put you a short walk from the Speakeasy Brewery and Taproom. Triple Voodoo is well served by multiple transit options. The simplest way is to exit the Embarcadero BART gates and go back down to the MUNI Metro platform (Exact change or Clipper Card). Take the K/T Sunnydale train towards Visitacion Valley to the 20th Street stop (between 20th and 21st). Walk back just half a block to the brewery. 1) The same instructions as above apply to any of the four downtown BART stations. 2) From the 16th St. station, walk to the southwest corner of 16th and Mission St. Board the #22 Fillmore bus ($2.00 exact change or Clipper Card). Take the bus to the end of the route at 20th St. and 3rd St. Walk back across 3rd St., turn left and walk 1/2 block to the brewery. 3) From the 24th St. station. (Recommended for day time travel only). Exit the station and walk to the southwest corner of 24th and Mission. Board the #48 Quintara bus ($2.00 exact change or Clipper Card). Take it to the end of the route at 20th and 3rd St. Walk back to 3rd St, turn right, cross 20th and walk 1/2 block to the brewery.